Frantisek Kovarik has recently published a new species of Chaerilus Simon, 1877 (Chaerilidae) from Malaysia. Chaerilus alberti sp. n. from Malaysia (Cameron Highlands) is described and fully illustrated with color photographs of preserved specimens, as well as of their habitat. 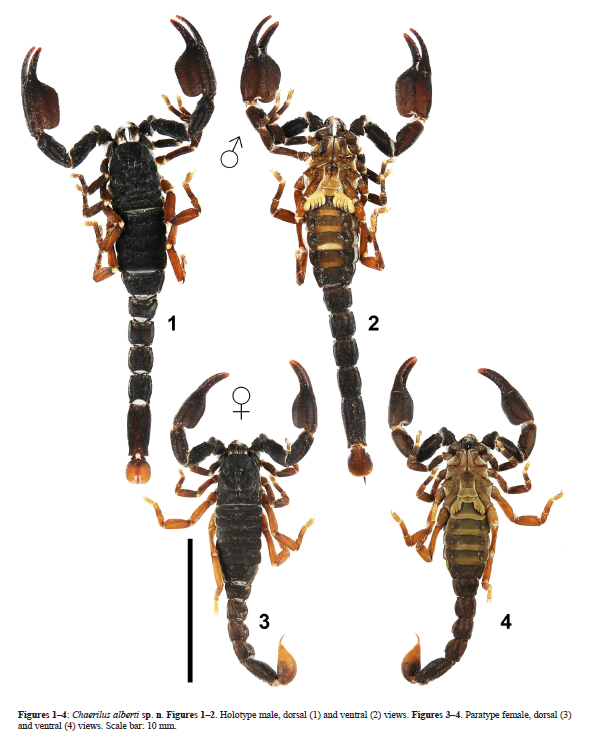 Males of C. alberti sp. n. have a unique shape of chela which is stout with the manus swollen anteriorly. They are compared to other species from Southeast Asia from all of which C. alberti sp. n. differs by the shape of pedipalp chela parallel or swollen posteriorly or medially. Pedipalp chela is illustrated with color photographs of 21 of these species.